EASY TRANSPORTATION: To reduce transport height on the Kubota RA2076 and RA2584 to 11'4", the tine arms can be removed. The swath board folds up automatically, creating a transport width of 9'2" for all 3 models. EXCEPTIONAL RAKING PERFORMANCE: Up to twelve tangential tine arms and four double tines per arm provide high tine frequency to ensure clean raking performance – even at reduced rpm and high travel speed. Infinitely variable cam track adjustment on the RA2584 allows fine-tuning to obtain optimum raking and swath formation according to crop conditions. OUTSTANDING DURABILITY: Kubota rakes are equipped for maximum raking performance. The RA2072 and RA2076 rakes feature 0.35" wire diameter tines, whereas the RA2584 rakes include heavy duty 0.39" wire diameter tines for outstanding durability. 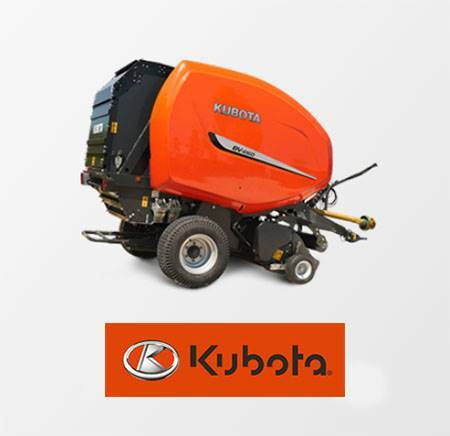 UNIQUE MANEUVERABILITY: Kubota's side delivery rotary rake has a carrier frame with rear wheel steering, allowing the rake to make turns up to 80 degrees. This is ideal for making tight turns on headlands and productive swathing, even in awkwardly shaped fields. When in headland position, an outstanding lifting height of 18” prevents swath damage. And with a lower center of gravity, this model has excellent stability. 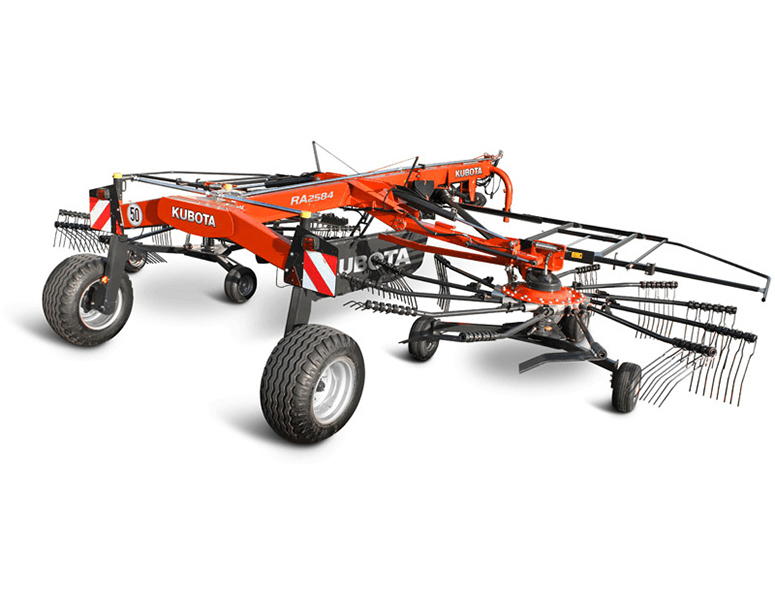 FARMLINE RAKES (RA2072 AND RA2076): Kubota's FarmLine double rotor, center swath rakes are perfect for all operations matching mowers up to 13’ in cutting width. FarmLine rakes feature oil-immersed cam discs, guide rollers and tine bearings, making them low maintenance. All rakes are fitted with curved tine arms, to ensure a regular and even swath formation in all crop conditions. Additionally, the curved shape increases the tine working area as the rake is moving and allows a higher lift out of the swath, which is critical in high volume crops, ensuring a very uniform swath. Our expert knowledge in producing the right swath not only optimizes the capacity of the baler, but also increases the quality of the forage. KUBOTA TERRALINK QUATTRO SYSTEM: The Kubota TerraLink Quattro System provides perfect ground contour following in three dimensions. The TerraLink system has an open construction of the frame, giving the rotor the ability to flex and follow ground contours and absorb shocks from reaching the rotor. The Quattro trailed axle configuration enhances the rotor’s ability to follow ground contours, with the wheels being positioned as close to the tines as possible – two wheels trailed and one in front. This positions the rotor right in the middle of the Quattro system and lets the tines work in the crop without contacting the soil. Transport - 9 ft. 2 in. 20 ft. 4 in. - 23 ft. 6 in.